Vegetable Garden Seeds Questions - NOTE: Sorry but VGG CANNOT accept questions which need a reply - there are just too many. The formation of this list of questions and answers regarding vegetable garden seeds questions is to meet this need so please help build it - it's a resource for you. Can I sow seed saved from the previous season? It deepends on how you store it! Seed rapidly looses its viability very quickly in moist and warm conditions so always keep them somewhere cool and dry. Many seeds are best stored dry, at fridge temperatures. This provides optimal conditions for avoiding rots, and for maximising the viability of the seeds by slowing down their metabolism and reducing their rate of deterioration. 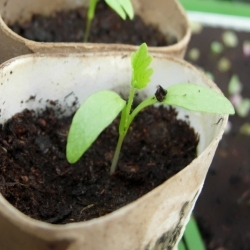 The best way to keep seeds dry in the fridge is to store them in paper bags or envelopes, which are then placed inside a plastic bag to protect them from the dampness often found in fridges. Alternatively seeds can be frozen indefinitely. How should a vegetable seed bed be prepared? A vegetable seedbed is any area of earth in your garden where you intend to sow vegetable seeds. The coarse surface soil must be broken down in spring to a fine tilth after you've finished digging it over during the winter months. 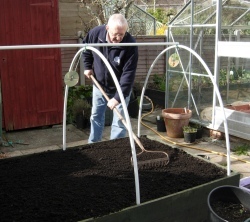 Rake the soil over several times in each direction, pulling stones and hard lumps to one side. Heavy or wet soil should be broken down in stages - or better still by letting it `weather` over the winter months it will be mostly done for you, especially if you get frosts. The water between the soil grains will expand by 7% when it freezes, and as it thaws the soil clods will crumble with the lightest of taps. 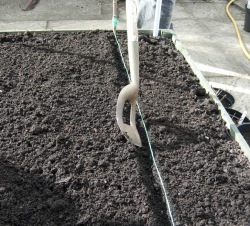 Dry soil may need to be made wet in order to rake it to a good tilth.